RIO DE JANEIRO, BRAZIL – Even in a country like Brazil, where football is traditionally played with the feet, American football has been enjoying a surge in popularity, from amateur beach games to the creation of a semi-professional national league. Since the late 1990’s, new men and women’s teams have been appearing all over the country, and the passion for the game is growing. Members of Rio’s Men’s League getting in on the action, image recreation. From the bruising, full contact football you see on TV to more a more leisurely version of the game played without pads on the beach, American football is one of Brazil’s fastest growing sports with a huge number of armchair fans and players adopting the sport. On Rio’s beaches, players getting together twice a week to play “flag” football in Botafogo and Copacabana is now almost as common a sight as beach soccer. The sport’s governing body in Brazil is the Associação de Futebol Americanos do Brasil (AFAB), and was formed in 2000 to meet the growing demand for the game. Today it is responsible of overseeing the development and growth of the sport across three national divisions and two age groups. The AFAB has grown from a few hundred members to well over 5000 in little over a decade, and the numbers continue to grow, with 18 men’s teams now taking part in the annual Carioca Bowl. Played on a pitch two-thirds the size of a conventional one, the cup has been dominated by the Botafogo Reptiles, despite losing out earlier this year to the Rio de Janeiro Sharks. A key reason behind the growth in popularity of football in Brazil is the increase in televised NFL games, with channels like ESPN Brazil regularly showing matches, complete with Portuguese commentary and analysis. Another factor is the easy accessibility of the non-contact version of the sport, which has helped attract a huge female following in a traditionally male-dominated sport. 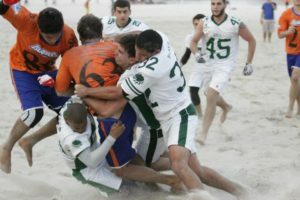 Traditional, full contact, Non-beach football is also growing in popularity in Brazil with 20 teams now playing in the Torneio Touchdown which has gone from strength to strength since it’s inauguration and attracts big crowds across the country. 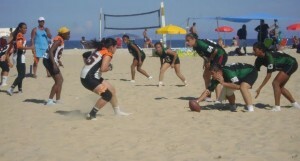 For more information on the league and playing American football in Brazil visit the AFAB website.